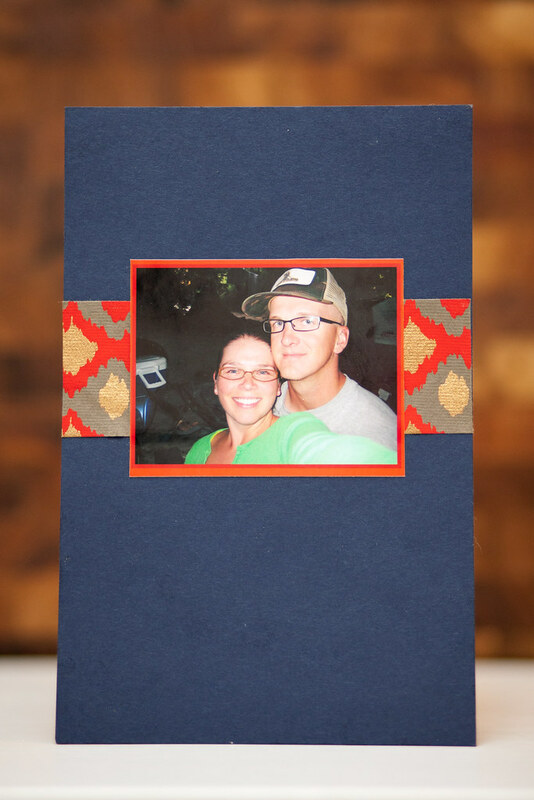 Madie & Alex are getting married this weekend (!!!) so figure I better get their wedding shower cookies posted (eash, I'm so behind, it ain't even funny) before they tie the ol' knot-eroo. It was a relatively small wedding shower -- just the bridal party basically, hosted by one of Madie's best friends and bridesmaid, Diana. I couldn't go because Cole was getting confirmed, but I HEAR it was a fun & fabulous party with some super yummy food, served up by the gracious host and hostess with the mostess. 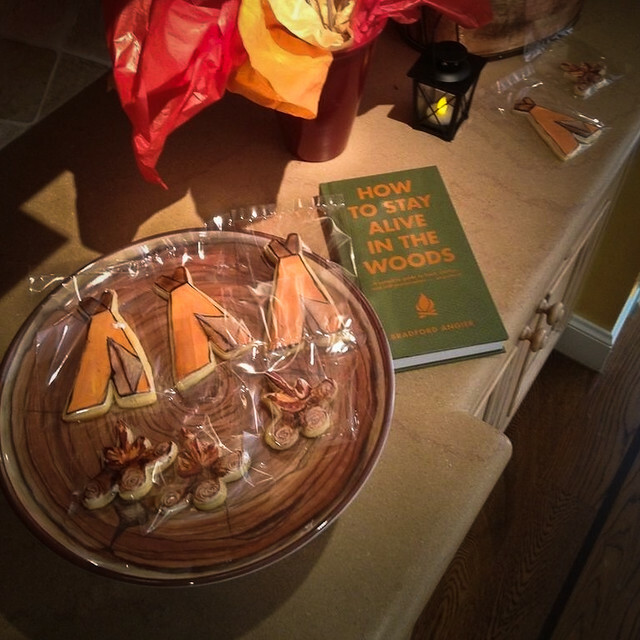 The theme of the shower was "camping" since Madie & Alex registered for some new camping gear. 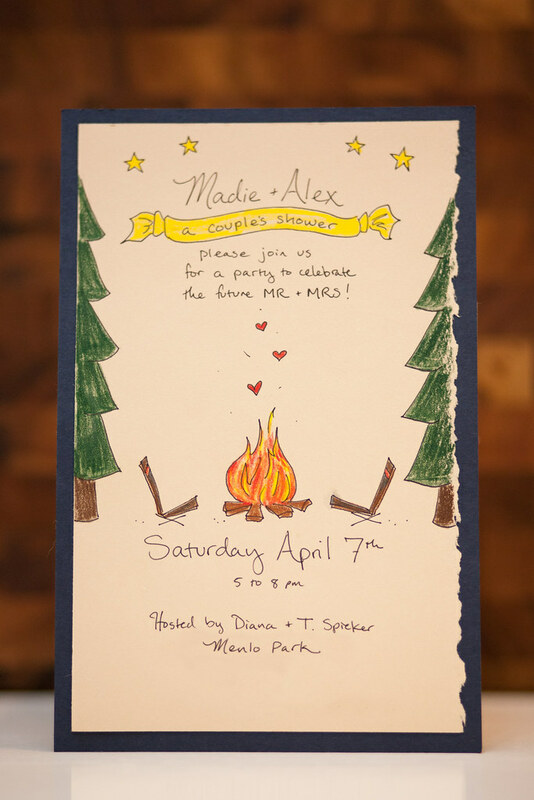 Here are the awesome hand-drawn invitations that very talented matron of honor (aka Vale) made. Aren't they AWESOME?!?! I adore them. 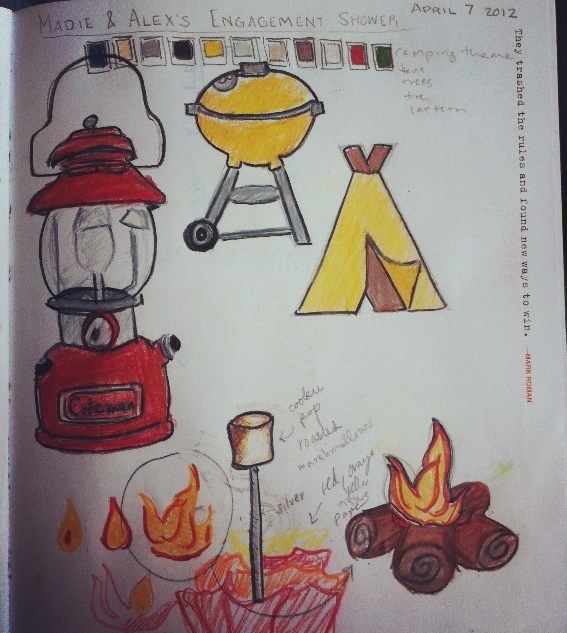 I planned out some camping cookies that I wanted to make for the shower. This was my sketch. I had to "cut" the Coleman Lantern and Weber Grill cookies for time reasons, but will find another occasion for those soon, I'm sure! So, I was really busy that week with my parents coming into town and getting ready for our Easter Brunch that for I think the first time I completely forgot to photograph the cookies!! Luckily, Vale snapped a few shots for me at the party with her iPhone so I at least have something to share. 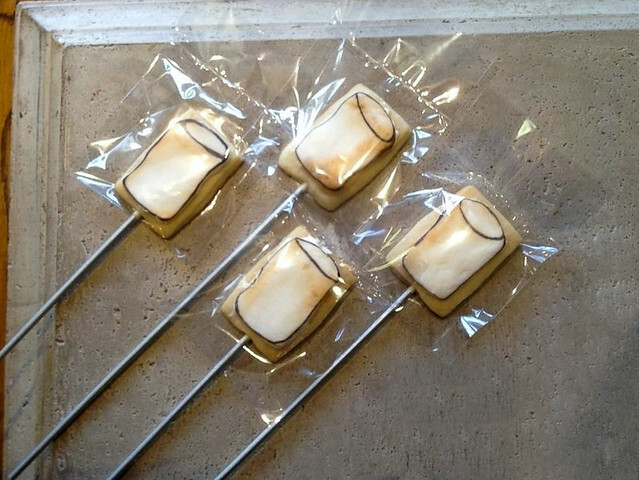 I made cookie pops decorated as roasted marshmallows. 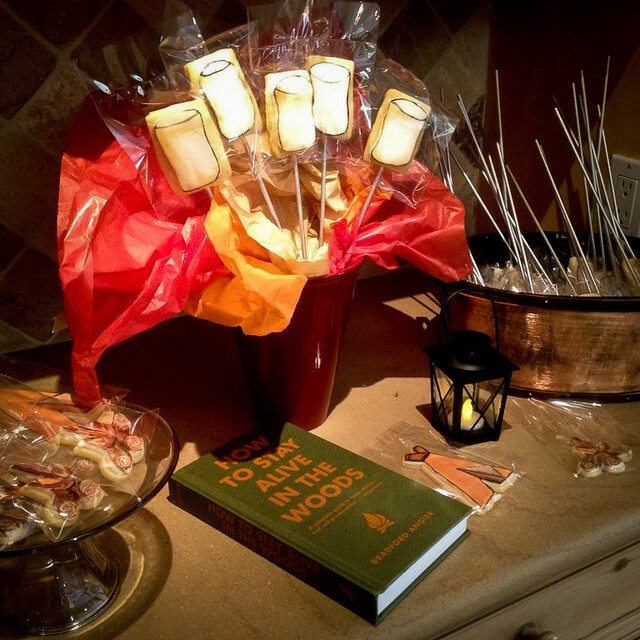 The extra long popsicle sticks are supposed to be skewers ( I painted them silver, except for the part touching the cookie). For the roasted marshmallow decoration, I used homemade marshmallow fondant (not my usual royal icing) and painted them with petal dusts and food coloring powder. I attached them to the cookie with marshmallow fluff. 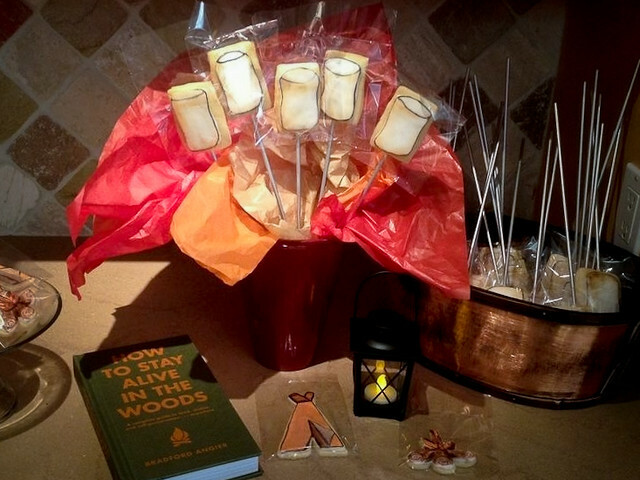 I also did a few "tee-pee" camping tents and campfire cookies, which I decorated with royal icing (I think?). 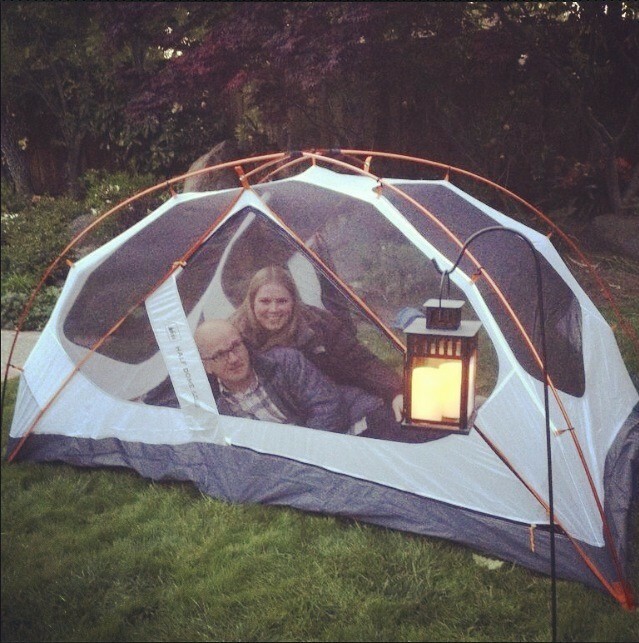 Here's the cute soon-to-be-mawwwied couple in their new tent! 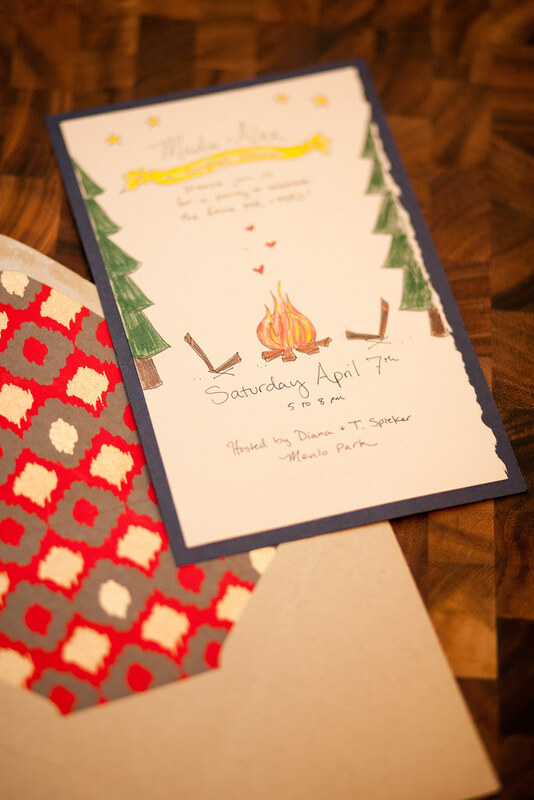 Getting very excited for the wedding this weekend. Can't believe it's really almost here!